As readers of this blog will know, my group was one of the first groups to publish software for the MinION sequencer, and I have blogged a couple of times on how to extract data from FAST5 files using poRe. Well BBSRC, my main funder, were kind enough to give us a grant to develop the software, and one thing we said we’d do is implement parallel processing. Below is a summary of what we’ve done so far. One of the huge benefits of R, besides the amazing suite of statistical and visualization tools, and the thousands of add-on packages, is the fact that parallelisation is really easy. In this context, what I mean by parallelisation is the use of multiple cores on your machine to run a single bit of code. By using multiple cores, the code is speeded up, often linearly relative to the number of cores you use. There are quite a lot of packages for R that help you run parallel code, including doParallel, foreach, snow etc. but we’re going to focus on the built in package, parallel. 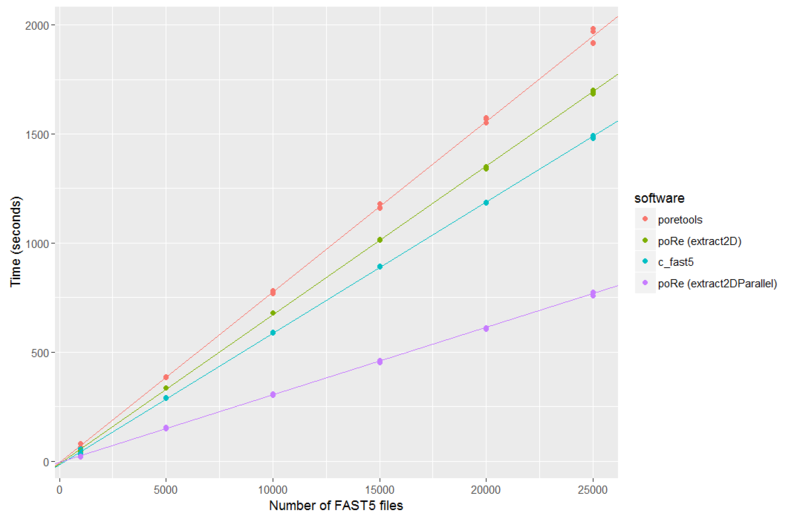 To show the benefits of this, we have run various toolkits for the extraction of 2D FASTQ data from 25484 FAST5 files kindly shared by Nick Loman. Now, as Matt Loose has pointed out to me, focusing on FASTQ extraction is a little pointless as almost certainly this will be built in to future ONT base callers; however, it serves as a useful example and there are plenty of FAST5 files out there already that you may wish to extract FASTQ from. The tools we compared are extract2D from poRe, poretools, fast5extract from c_fast5 (a simple C implementation) and extract2DParallel, a parallel version of extract2D (the parallel scripts are in the “misc” folder in GitHub). We ran each tool 4 times on 1000, 5000, 10000, 15000, 20000, and 25000 randomly selected FAST5 files, clearing the cache completely between runs to ensure a fair comparison. As can be seen, all tools perform linearly with the number of FAST5 files; poretools is the slowest, then extract2D, then c_fast5. However, the best result is clearly from extract2DParallel (using 4 cores) which outperforms everything else by some distance. Of course, this is not surprising, and doesn’t come without a cost – if you only have 4 cores then using all 4 will mean all other processes perform really slowly. However, there are also benefits – if your machine has 8 or 24 cores, you can speed up processing even more. The scripts on GitHub should be treated as an early release and have only been tested on one dataset, so I welcome your feedback! my.dir <- "C:/MinION/FAST5/" # use your own directory here! Parallelisation is so easy within R it's almost criminal not to do it. We can see that just a bit of parallelisation speeds up the code incredibly - and we can also see that poRe is a pretty fast toolkit when used in the correct way, which it wasn't in this paper. NOTE I am fairly new to benchmarking and parallelisation, if I have done anything wrong, I apologize - and please get in touch!